The best salad bar in town comes to Uptown Oakland. 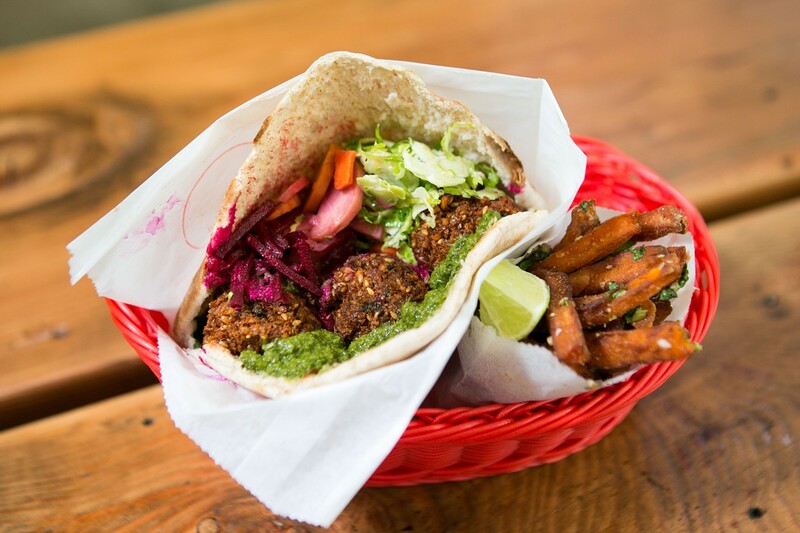 Liba's falafel is nutty and crunchy, and its sweet potato fries are the best in town. Hours: Mon.-Fri. 11 a.m.-2:30 p.m.
Gail Lillian has loved falafel for a long time. But five years ago, when she first started planning Liba Falafel, her food truck business, no one in the Bay Area was serving the kind of falafel she wanted to eat. They were almost always wrapped inside thin lavash (like burritos), were deeply savory, and left you with a mouth full of garlic breath. None of them contained, say, fresh fruit. What's more, there were hardly any self-serve falafel bars like the one Lillian recalled visiting in Amsterdam years ago — a hole-in-the-wall spot that offered a selection of raw salads she could use to dress her sandwich. That was the innovation of Lillian's mobile-food business — not the simple fact that she was serving falafel from a truck, but rather the colorful spread of seasonal salads, sauces, and other toppings that she'd set up on a counter outside, allowing customers to help themselves. So it's no surprise that the highlight of Lillian's new Uptown Oakland brick-and-mortar restaurant is a dynamite serve-yourself salad-and-toppings bar that puts the ones at your local deli or the Whole Foods prepared-foods section to shame. Even on the truck, Liba's falafel bar offers about fifteen different toppings and spreads. At the restaurant, that number swells to twenty — and includes items such as brussels sprout and apple slaw and an intensely lemony hummus, served in a squeeze bottle. About three or four items get swapped in each week to highlight whatever is in season. Ordering at Liba is mostly a matter of deciding if you're in the mood for a sandwich, which comes on grilled pita bread, or a salad — the best option if you really want to go to town at the fixins bar. Various combo meal options allow you to add a side of soup or sweet potato fries, or one of the not-too-sweet seasonal agua frescas, at a slightly discounted rate. Once you have your sandwich or salad container in hand, it's time to move on to the falafel bar, and your impulse — not a bad one — will likely to be to try a little scoop of everything. For me, standouts included the brussels sprout slaw, which had crisp julienned apple that added a wonderful freshness, and the braised eggplant, which came in a curry-like tomato sauce. Batter-fried pickled onions and candied rosemary peanuts made for excellent garnishes, and added an extra element of crunch. During my visits, the restaurant offered three seasonal items, all excellent: a smoked apple chutney (for a bit of mushy, smoky sweetness); a refreshing cucumber, tomato, and watermelon salad; and, best of all, pickled rainbow-carrot rounds that were like pink-and-orange candy. For those who crave heat, three house-made hot sauces all pack a wallop — a fiery red harissa sauce flavored with freshly ground caraway seeds; a bright-tasting green zhoug; and, once you're seated, a bottle of orange habanero-and-vinegar hot sauce — vegetal sweetness followed by a slow burn. It is perhaps an odd thing to get two-thirds of the way through a review of a falafel shop with little mention of the falafel itself, but that is the wonder of Liba: I would happily make a meal of just salad fixins (and maybe a side of sweet potato fries). But the falafel is worth discussing, too. There are restaurants that serve falafel balls that are fluffier, or herb-flecked ones that have a stronger undercurrent of parsley and cilantro, or ones with more of a garlicky kick. If anything, Liba's version is studiously neutral-flavored and, if ungarnished, a little bit dry. Instead, what distinguishes these falafel balls is the crunch of the sesame-seed-studded outer crust, which Lillian achieves by grinding the garbanzo beans much more coarsely than is typical. The result is nutty, super-crunchy, and utterly sog-resistant — a textural delight. A standard sandwich comes with three falafel balls, but I like to request mine with only one or two balls inside the bread, with the rest on the side to be added later. This allows you to maximize those salad-bar toppings, and to layer it all so that you get a bit of falafel in every bite. Liba's build-it-yourself approach means it's up to you to practice the finer points of proper sandwich construction. The sandwiches do not, as a general rule, make good takeout fare — all of those wet ingredients from the salad bar quickly turn the bread to mush. If you know you'll be in transit for more than, say, ten minutes, the falafel salad (with optional pita wedges on the side) is the way to go. Everything on the menu is vegetarian, and most of it (with the exception of the raita and the crumbled feta cheese) is vegan. 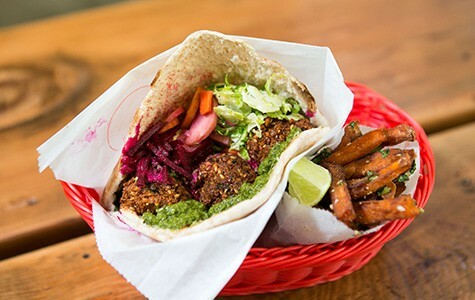 But, as is the hallmark of any good falafel shop, Liba doesn't deprive meat-lovers. Part of that, of course, is the power of a deep fryer to make any food feel decadent. Certainly, Liba's garlicky sweet potato fries aren't anyone's idea of health food, but they are also, hands down, the best in town: the perfect balance of crunchy and soft; and of sweet, savory, and caramelized flavors. (The secret, Lillian said, is to use fresh-cut sweet potatoes, and to toss them in rice flour for extra crispness.) Or, if you want to really indulge, try The Love Boat, which adds crushed falafel pieces, harissa, and raita to the fries. This would probably make a fine stand-alone meal if you're not too concerned about covering all your food groups. Daintier, or more health-conscious, eaters might opt instead for the weekly soup selection —almost always a creamy (but non-dairy) puréed vegetable soup — or a bag of thick, well-spiced pita chips. At the end of the day, it would not be inaccurate to call this "fast food," but with none of the term's pejorative connotations. Although the lines during the lunch rush are no joke, the food usually comes out within a couple minutes of having been ordered. And the layout of the space — all counters and stools — is such that no one is likely to linger for hours on end. Still, it is a happy place. The music is peppy; the walls are a bright lime-green. And it's set up so that you feel equally comfortable whether you come in with a group of coworkers or as a solo diner, tucked into a corner with a book, and good food, to keep you company.